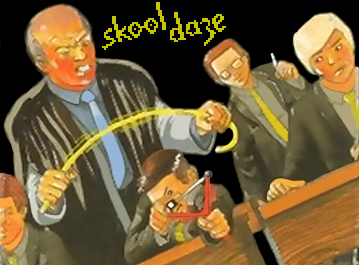 The classic SkoolDaze game is finally available for your Oric! We tried to keep it as faithful to the original as possible, which has been a really difficult task due to the Oric 6 pixels per byte display. You can follow the development progress in the Defence Force forums. Some small differences exist, though. A few of them are intentional, others just due to slightly different code. 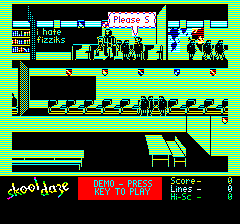 Anyway the gaming experience should be the same than in the original Spectrum version. OK. So all the shields are upside-down, disorienting the poor masters. Knock them over now and, before they can stop themselves, they'll reveal their letter of the code. All except for the history master, of course, who because of his great age and poor eyesight can't be trusted to remember. His letter has been implanted into his mind hypnotically. To make him reveal it, you must find out the year he was born (which, in case you were wondering, changes each game). Then, creep into a room before he gets there and, if the board is clean, write it on the blackboard. When he goes into that room and sees his birthdate he will, as if by post-hypnotic suggestion, give away his letter. Now that you know all the letters of the combination, all you have to do is work out which order they go in. You know that the Headmaster's letter is always first, but as for the other three ... you'll just have to try the various possibilities. Find a clean blackboard and write out a combination. Rush back to the staffroom and jump up to reach the safe with your hand. If nothing happens, then the combination must be wrong, so you'd better find another clean blackboard and try a different one. With the safe open, your troubles still aren't over, as the upside-down shields are rather a giveaway. You now have to hit all of them again. Boys are expected to walk quietly in the corridors, they are not for running or sitting in. Due to restrictions imposed by the owners of the copyright (see below), we cannot offer a direct download of this game here. Downloading should be done through www.oric.org, where you need to be a registered user. Please do not put the files anywhere else for downloading. 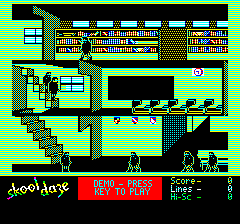 If you want to load Skool Daze on a real Oric, just convert it to wav first, using tap2wav or tap2cd (Check for those on Fabrice France's site and read the instructions). However, along with the release of this game, you should find a pre-generated wav file with a custom fast loader. It is only valid for 1.1 ROMS, beware. We have tested the loading process on different machines and with different tools and it is quite reliable once the appropriate volume setting is found. If the loading is aborted (usually with an 'Errors found' message, though it might not be visible if already in HIRES mode -- just the 'Ready' prompt) try altering the volume until the game loads and auto starts. If you are using a modified ROM with 60Hz and you want to generate the wav file from the tape image yourself, you should get to HIRES mode *before* loading the game, so it does not set the HIRES 50Hz mode. Just issue a HIRES:CLOAD"" command and it should work. As the pre-generated wav files witches to HIRES using a ROM call before loading the screen, it should work with modified ROMs. 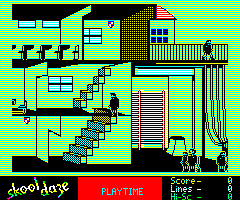 The rights for this game currently belong to Alternative Software Ltd. Elite Systems Ltd. has recently produced an incredible version of the original Spectrum game for iOS with dedicated controls and other extras. Check it out! 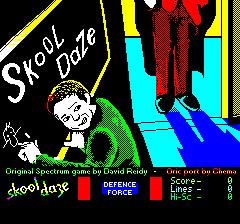 This version of Skool Daze would have never seen the light without the help of the Oric community. Thanks to Symoon for providing the first approach of the loading screen, and Dbug for his work in refining it, and also for his ideas about how to reduce the code size. Thanks to Symoon, Dbug, Twilighte, Anti/rad and all the rest of the oricians who tested the game and provided feedback and ideas. Special thanks to Richard Dymond (SkoolKid) for the incredible work he did in commenting the disassembly of the original game in his site, which was an invaluable source of information.